White’s have serious vintage and they know their oats. They’ve been milling them in Tandragee, Co, Armagh, Northern Ireland for over 175 years. In fact they’ve got the process down to a fine art and their oats have won many Great Taste awards for their distinctive nutty creaminess. They are Ireland’s largest oat miller and the only oat cereal producer in Northern Ireland. From porridge oats to granola, you’ll find a whole variety of oaty products to choose from, including organic ones. Their jumbo organic oats are available via Waitrose and pretty much anywhere in Northern Ireland. There’s not been a great deal of research done on oats in recent years. White’ s, however, has stepped in to the breach and is on a quest to produce the perfect grain, one which is easy to grow and mill, nutritionally dense and tasty. They work with a group of 30 (and growing) British organic oat growers trialing varieties and cultivation techniques. I was invited up to this year’s trial site at Abbey Home Farm in the Cotswolds to find out about the fabulous grain that provides us with our morning porridge, overnight oats and so much more. You can #TasteTheJourney by following the White’s story on Instagram, Twitter and Facebook. Abbey Home Farm is a large mixed farm and is Soil Association certified. It has a fabulous organic café which serves mostly vegetarian food, much of which comes from the farm. Lunch was provided for us after our trip around the fields and it was delicious. We started the day, however, with introductions and a very oaty breakfast supplied by the team from White’s. We sat down to a beautifully decorated breakfast table alongside such dignitaries as: White’s General Manager, James Mathers; Andrew Trump from Organic Arable and the Farm Manager at Abbey Home Farm, John Newman. I was delighted to find that fellow blogger Gemma from Celery and Cupcakes was amongst the gathering. We tucked into Whites’ granola with the farm’s own organic strawberries and yoghurt, which was an utter delight. This was followed by delicious fluffy pancakes served with maple syrup. The pancakes were made with oats of course. We rounded the meal off with an oaty organic chocolate truffle – or two. What a treat! Whilst we enjoyed the breakfast fare laid out before us, we found there was much to chat about. Questions and answers positively flew around the table and the passion that White’s and their partners have for all things oaty was very much in evidence. Oats (Avena saliva) grow well in the British climate, both as spring and winter crops. They are an excellent and versatile crop for an organic system and as we toured the fields, John waxed lyrical about them. They grow tall so they shade out most of the weeds, they are less susceptible to disease than other grains and the stalks make a nutritious animal feed. Oats are also beautiful to look at. But goodness me, there is an awful lot more work that goes into oat production than I’d ever realised. Sowing, harvesting and milling is just a small part of it. Building up and maintaining the soil, checking for disease and shipping are just a few more of the processes involved. However, summer is drawing on and the elegant dancing golden oat heads will soon be harvested. Bring it on. Earlier in the year, eight varieties of oats were sown, each with different seed rates and different depths. There are 64 trial plots in total. The idea is to see which varieties perform best and at which seed rate and depth of planting. When we arrived at the trial site, a group of growers led by White’s agronomist, Raymond Hilman, were evaluating progress. Oat husks contain three kernels. The problem is that two of the grains grow big and plump, but one remains small. White’s has a high quality control in place and is looking for well developed grains that are easier to mill and produce a better tasting product. This means the smaller grains have to be removed from the process, preferably before they are shipped off to White’s. This makes more work for both the growers and White’s as well as increasing costs. One of White’s aims is to produce a husk which either contains three plump grains or two even larger ones. In today’s superfood charged world, it’s great to know that the British oat is up there with the best of them. It’s a wholegrain and as such contains four times the amount of dietary fibre found in refined grains. This helps to maintain good gut health. Oat groats are also an excellent source of protein, vitamins, minerals and antioxidants, which is why they are such a great way to start the day. They have the additional benefits of being low in saturated fat and helping to lower cholesterol. Organic oats have always been a staple in my kitchen. Energy balls, or bliss balls as I like to call them, are one of my go to treats. They’re easy to make, tasty and so much better for us than a chocolate bar, biscuit or slice of cake – unless the latter are some of my creations of course. They often include oats. 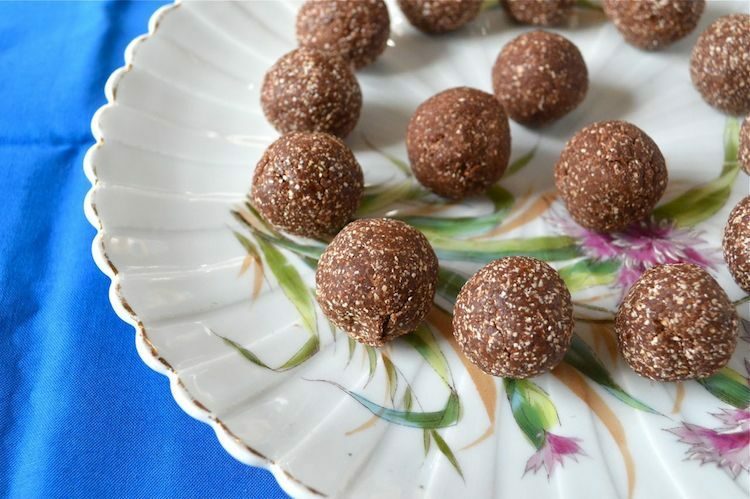 This organic chocolate truffle recipe from White’s is super simple to make, not overly sweet and only contains four ingredients: oats, dates, cocoa and salt. I may have added a little cinnamon to mine – I just couldn’t resist. 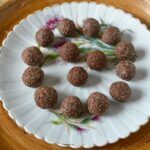 Healthy chocolate oat truffles which are just as good to eat for breakfast as they are after a meal. They also make for a great energy boosting snack. Blend the oats in a food processor or blender until they've become almost flour (I used my Optimum G2.3 Induction blender). Add the remaining ingredients and blend until the mixture comes together. Take heaped teaspoonfuls and roll into balls. Eat straight away or place in a sealed container and keep in a cool spot for up to a week. If the mixture is too dry, add a little water. Roll the balls in desiccated coconut for extra pizzaz. Recipe for Organic Chocolate Truffle. PIN IT. This post was commissioned by White’s. I was not expected to write a positive review and all opinions are, as always, my own. This post contains an affiliate link. Buying through a link will not cost you any more, but I will get a small commission. Thanks to my readers for supporting the brands and organisations that help to keep Tin and Thyme blythe and blogging. I LOVE oats! I can snack on plain toasted oats all day long…I think they are already very delicious without anything else. These truffles look very healthy and delicious, Choclette. It’s true Angie, oats have a lovely flavour, though I’ve not tried snacking on plain toasted oats before. Thanks Monika. It was a really interesting and enjoyable day out. We love oats, the great thing about oats is that you can conjure up so many delicious recipes with oats. These truffles look so delicious! Thanks Jagruti. It’s true oats are very versatile and truly delicious. Yes, I’d be completely lost without oats in my life. The flavour of the oats in these truffles really shines through and they are so easy to whip up too. Love the post! I couldn’t live without oats, that’s for sure. The truffles look amazing too! Sounds like a wonderful experience and such a treat! Your truffles look amazing. They’d make a great holiday hostess gift! Thanks Ellen. It was a wonderful day with lots of good food and interesting information. What a great and tasty treat! Love the pics from your trip to Abbey Home Farm! Yes, interesting and tasty. And oats are one of my favourite foods, so it was an all round good day. So, you were very near us. How did I miss that you were travelling in our direction, I would have invited you for lunch/dinner/tea. These healthy truffles sound lovely. Oh, are you close to Abbey Home Farm? It would have been lovely to see you. Yes, I really enjoyed finding out about our humble oat and seeing the dedication that goes into producing it. It was a thoroughly enjoyable day. Bliss balls sound like a lovely treat to take to your classes. No wonder they are appreciated. Love your account of the day Choclette. I also really enjoy making energy balls like this for a quick snack. Oat make them really filling, yum! It was a thoroughly enjoyable day and good to see you there too. As for energy balls, I find they make a great substitute for sugary snacks, which is all to the good. What a brilliant visit, it looks so fun, but then I am a farmer! Your oaty bites look amazing and would be a real treat for breakfast or a snack. Haha, yes you would have liked it Janice. I think most people interested in their food would have enjoyed the visit, but the fabulous weather certainly helped. Funnily enough, I never eat oats but give some as porridge to my kids. These energy balls look like a fab healthy snack, a great alternative to all the sweet junk out there. You don’t like oats Michelle? Try these energy balls on your kids and see what they think. Great recipe! Thanks for sharing so much info on oats. It sounds like you had a great day out. These are the simplest energy bites I’ve ever made, but so good. We had a fab day out – really interesting. They are super easy to make Kate. Energising and delicious. Love the sound of these Choclette! So easy to make and ideal for a quick snack. Ooh what a great idea to use oats in truffles! Will have to try that out. Thanks for sharing! I often use oats to make energy balls, but usually in smaller quantities along with nuts. This no-nut recipe works surprisingly well. Aw, thanks Vanesther. I can honestly say I know more about oats now than I did before the farm visit. Nice to hear from you. Hope the kids like them, they’re not particularly sweet, but you could always add a bit of maple syrup if they don’t pass muster. What a lovely chocolate truffle! Yes of course they do Rebecca. White’s oats aren’t certified, but there are quite a few here in the UK that are. And at least you can generally trust British certifying bodies. The look amazing! Thank you for sharing This great recipe. It’s an excellent recipe and very quick to make. I have oats, cacao and dates in the cupboard – I’m off to plug in my blender! Haha Cathy. You mean your blender is not permanently plugged in?